Double P... look familiar? I am so excited to share with you the Purpose Project. No, I'm not raising money again, but am just so thrilled that Pixie Project has grown into something that will continue to give awareness and support to the women at risk in Ethiopia as well as other needs like clean water and orphan care in Africa. Purpose Project -- One Month to reach your goal, all the motivation you need. So like my Pixie Project from August now anyone can "turn apprehensive ambitions in to something fun and important with the support of your community." Ahhh I'm so pumped. But it doesn't have to be chopping off your hair! What is it that you've always wanted to do but never had the motivation? Sky dive? Run a half marathon? Audition for a play? Ideas are endless. I'm so excited to see these girls embark on this journey. 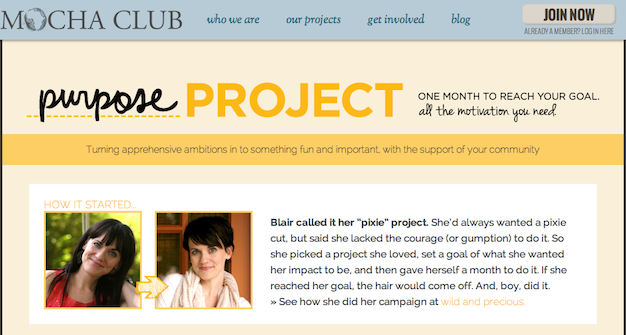 My experience with the pixie project was so much more meaningful and personally insightful than I ever imagined. I learned so much about myself as a blogger, as a woman, and as a believer. And on top of that the lives of six women were forever changed! I put together a page chronicling my whole journey including videos as well as tips and advice for starting your own project. You can find that page by clicking here. Thank you again to all of you who donated, helped spread the word, and encouraged me through my project. I am so proud of the direction The Purpose Project is going with the Mocha Club and for all the hearts and lives that will be changed in the process. So excited to follow their journeys!!! YAY! So awesome! Excited to see how the Lord works through the projects! Also, can I just say that your comments on my blog have literally made my year! You are so sweet and truly encouraging! Thank you! Happy weekend! Hope you have a wonderful time with your little family!